A new gated development of eleven luxury homes in an unrivalled rural location in the heart of Hampshire’s picturesque countryside. 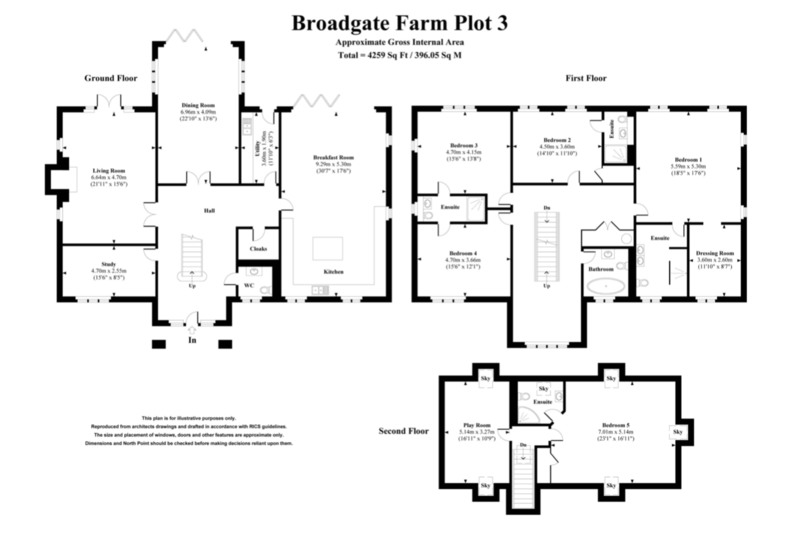 Broadgate Farm is a new gated development of eleven prestigious homes from house builders English Developments, complimented by beautiful landscaped gardens in the idyllic location of Ampfield within the heart of the Hampshire countryside. The development is situated two miles to the east of the thriving market town of Romsey and seven miles south of the historic City of Winchester. Ampfield has a local church, village hall, restaurants, pubs and shops all within a short drive away. Families will appreciate the excellent schools in the area, including Sherborne House, Stroud, John Keble Primary and Ampfield C of E Primary School and others within a few miles. Ampfield is surrounded by beautiful countryside ideal for walking, cycling and riding. A local golf course in Ampfield, Sports Centre and The Rapids in Romsey a short drive away. These substantial homes are designed in a contemporary style yet very much in keeping with their natural surroundings. Broadgate Farm is a development of eleven detached three storey traditional homes, all individual and finished with style and finesse. Throughout the homes, detailing is impressive and includes oak internal doors with contemporary chrome door furniture. Feature oak staircases, bespoke triple glazed windows and porcelain tiles in kitchen, utility and dining areas. Broadgate Farm, a cluster of luxurious properties boasting stylish interiors and high quality fixtures and fittings. Every detail is carefully considered. The owner shall have the choice of kitchens and designs to fit their individual needs and wants. You shall meet with the kitchen specialists and design your own dream kitchen. All kitchens will include Aluminium Bi-fold doors. The owner to have the choice between Porcenalosa or Villeroy & Boch (or similar). Fully tiled bathroom / en-suites with Porcenalosa tiles. electric towel warmers. All homes to have an individual rainwater harvesting system, which will provide water for flushing WC’s and the washing machine, together with garden water. Broadgate Farm is situated in between Romsey and Winchester. It is quite simply a beautiful city, steeped in history, with the stunning cathedral at its heart, yet coupled with an eclectic blend of chic boutiques, restaurants and cafés, plus an excellent year-round cultural programme with highlights including top class literary festivals, exhibitions and theatre productions. All of this within easy reach of London, a choice of international airports, and the beaches of the south coast as well as the natural beauty of the New Forest and the South Downs National Park. And of course, if you love golf, one of the best courses in the county is on your doorstep.